For those of you who don’t already know, Hello Beautiful Salon offers full makeup application for events and weddings! It is a service that is unique in the typical hair salon, but we want to offer our clients a wider range of high end services. Offering services such as facial waxing, strip lash application and professional makeup application provides our clients with the convenience of a one-stop-shop for all of their beauty needs including Photographic Benefits Contouring Hair salon Fort Lauderdale! This is especially important for our bridal parties or others planning a group event such as bachelorette parties. The ability to get all of your girls (and guys) gathered in one place to drink wine while being pampered and glammed up for your next event is the kind of service we strive to provide at the Best hair salon Fort Lauderdale. As with any big event, pictures are a huge part of the day or night! These pictures will forever capture the magic of the moment, to be distributed to friends and family across social media and beyond. So its no wonder everyone wants to look their best! 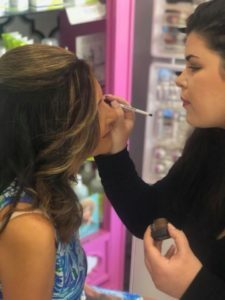 You may think “why pay someone to do my makeup when I manage to do mine myself everyday?” While this may be true, and you might even do a great job at your daily makeup routine, the truth is professional makeup application specifically for photos Photographic Benefits Contouring Hair salon Fort Lauderdale is a whole other animal. As Im sure you’ve already learned with most beauty products, not all makeup is created equal! Many drug store beauty brands have reflective properties that do not bode well in photos. Foundation is especially concerning in this regard since the flash of a camera can make your face look whitewashed compared to the rest of your body. Unless you are a geisha, this isn’t a good look for anyone! At our Fort Lauderdale hair salon Hello Beautiful we use the professional cosmetic line TIGI to help you obtain that picture perfect look that will have you saying “I’m ready for my close up!” My personal favorite is their creme foundation. Optimal Diffusion Powder contains light-diffusing microspheres to help blur against fine lines and pores. It provides a light weight full coverage matte finish that lasts all day and night! This is a great option for anyone looking to hide imperfections and disguise pores, which is basically all of us! And best of all it won’t leave you looking washed out in photos! Facial contouring and highlighting with makeup is a relatively new technique that allows you to highlight and downplay certain features. When done correctly, it enhances your beauty by playing up those cheekbones and providing the ability to disguise certain features such as nose width and forehead size. When done incorrectly, quite frankly its a disaster. We’ve all seen it happen, even in celebrity photo’s where bad contouring leaves them looking more like ventriloquist dummies than the beautiful women they are! This is probably why the average person shy’s far away from this new trend. I can’t say that I blame them since contouring and highlighting your face properly requires a little scientific understanding of anatomy as well as an artistic flare! Faces come in all shapes, sizes, and color variations which all play a pivotal part in the process. When properly applied by a professional, you can achieve that celebrity makeup style that will really make you stand out in photos. Another must have for any event are lashes! In photos they really make your eyes pop and add another depth to your makeup style Photographic Benefits Contouring Hair salon Fort Lauderdale lashes come in many different shapes, lengths and densities to match the look you want! We also offer Hair extensions Fort Lauderdale to complete your look for any event!